29-year old American (has also Bissau-Guinean passport) guard K.C. 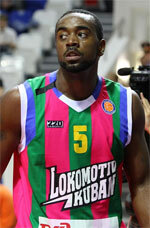 Rivers (196-98kg-87, college: Clemson) left Real Madrid (Liga Endesa). Rivers played there also last season. In 10 games he averaged 8.7ppg, 2.7rpg and 2.0apg. He helped them to win Spanish Cup (Copa del Rey) last season. Rivers also played at Bayern Muenchen (BBL) in German league that season. In 13 games he had 15.0ppg, 3.4rpg, 2.2apg and 1.0spg. Among other achievements he won Spanish Liga Endesa championship title in 2015. Rivers received also All-ACC Honorable Mention award back in 2009 at his college time. Rivers is a very experienced player. He has played also professionally in France (Chorale de Roanne), Italy (Benetton Treviso, Latina Basket and Virtus Obiettivo Lavoro Bologna), Russia (Khimky and Lokomotiv) and D-League (Reno Bighorns). Rivers attended Clemson University until 2009 and it is his eighth season in pro basketball. His game is described as: One of the top all-around players on the team, he possesses a strong basketball IQ. Has shown to be a solid rebounder. Can score in lots of ways, he's also a good defender on both guards and forwards.